Lesley Gillespie first joined Slow Food in January 2013. 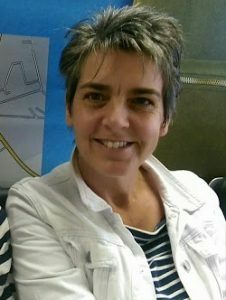 In July 2016 she joined the Slow Food Aberdeen City & Shire committee and is now Producer Liaison and Chef Alliance contact. In February 2017 Lesley became the first chef in the Aberdeen City & Shire area to be accepted as a member of the Slow Food UK’s Chef Alliance. Lesley Gillespie grew up in a family heavily immersed in the fishing industry and in an environment where food was fresh,seasonal and locally produced (often from the garden) and above all, home cooked. These principles shaped Lesley’s outlook on food as a whole and influenced her decision to train as a professional chef. Having completed three years in Advanced Professional Cookery at Aberdeen College Lesley remained there to teach as a Chef Lecturer both in the kitchen and front of house before moving on to manage the Garioch Community Kitchen in Inverurie. Here she taught a wide range of cooking skills to both children and adults with an emphasis on using healthy nutritious produce to enrich the diet of individuals and their families. After completing a Masters Degree in Gastronomy at Edinburgh’s Queen Margaret University in 2015 and with an interest in wild foods, Lesley undertook a variety of venison research projects with the QMU Scottish Centre for Food Innovation. As a freelance chef, private classes and functions are the norm. produce.